Rivet contacts are widely used for various applications from low current fields such as communications equipment to electric power equipment with high cutoff currents. With our own developed header machine, dimensional accuracy has been improved to meet a variety of needs. 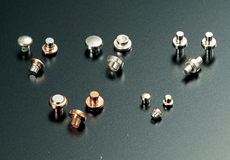 Various types of rivet contacts are available (combination of different shapes and materials). Superior surface-processing technologies reduce dimensional variations and realize stable contact resistance. Flowline control technology for clad contacts achieves low cost production. Relays and switches for automotive, consumer, and industrial use, and magnet switches, breakers, etc.